While it is legal to build this building on this lot under current zoning (R2.5) it’s worth noting that this is a double lot. The four-plex fits entirely on one half (a 50x100 lot) and only it’s garage and backyard occupy the second lot. However, on a 5000sf lot, it would definitely be illegal to build this, since it would be twice the allowed density. 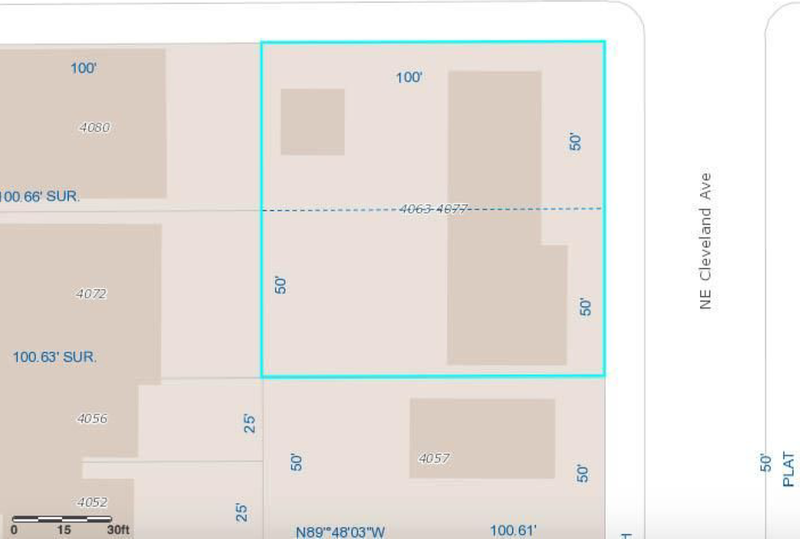 If zoning permitted, a second small building or a couple ADUs could potentially fit on the west half of the site, including converting the existing garage. Note the corner condition. This works because the long side of the building faces the street, along the long side of the lot. This can only happen when the long side of a lot faces a street. It wouldn’t work as well on a single lot mid-block. Oddly enough, the building straddles a lot line rather than sitting on one half of the site. Imagine it rotated 90 degrees and sitting on the northern half. That’s what I would do if I were building this, but somebody did it this way, for… reasons.